If you don’t know about Chia seeds, you are in for a treat. Listen up: 70% more protein than soybeans, 25% more fiber than flaxseed, 600%, yes 600%, more calcium than milk, 200% more potassium than a banana, and 30% more antioxidants than blueberries. This is not food. It is super food. Come back from more chia recipes. 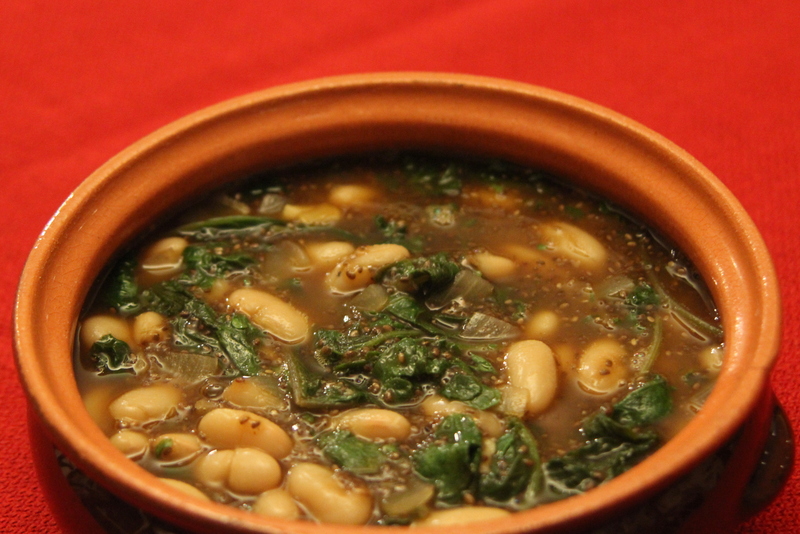 Today, I cooked this simple yet satisfying soup with beans and baby kale. Ready in 20 minutes, total. How to cook: In a pot, heat the olive oil. Saute the onions for about 5 minutes. Add the garlic and sautee for another minute. Add the baby kale, broth, salt, pepper, red pepper flakes, chia seeds and lemon. Cook at low temperature for about 5 minutes. Add the cannellini beans for another 5 minutes or until they are well-heated. Add the chopped parsley and serve! References: The information about the nutritional value of chia as well as the recipe are from “The Chia Cookbook” by Janie Hoffman. The suggested spinach substitution as well as the use of beef broth are mine.